The “Mother Road” is in Our Backyard! Check Out Historic Route 66! U.S. Route 66 (also known as the Will Rogers Highway and colloquially known as the Main Street of America or the Mother Road) was a highway within the U.S. Highway System. One of the original U.S. highways, Route 66 was established on November 11, 1926 – with road signs erected the following year. The highway, which became one of the most famous roads in America, originally ran from Chicago, Illinois, through Missouri, Kansas, Oklahoma, Texas, New Mexico, Arizona, and California, before ending in Los Angeles, covering a total of 2,448 miles (3,940 km). 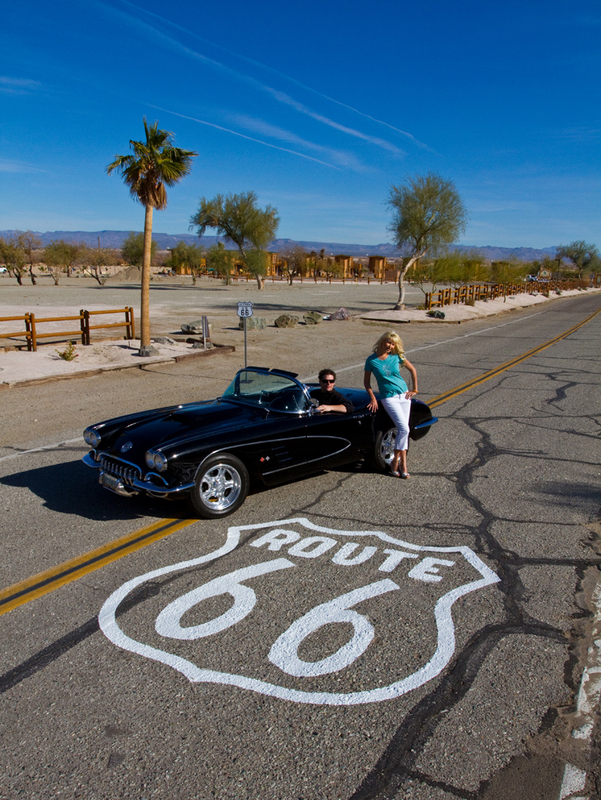 Route 66 underwent many improvements and realignments over its lifetime, but was officially removed from the United States Highway System on June 27, 1985 after it was decided the route was no longer relevant as it had been replaced by the Interstate Highway System. Portions of the road that passed through Illinois, Missouri, New Mexico, California and Arizona have been designated a National Scenic Byway of the name “Historic Route 66”. 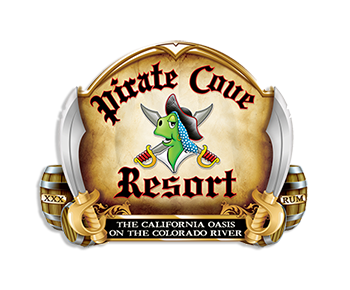 Now you can experience this piece of history of the “Mother Road” right in our back yard at the Pirate Cove Resort & Marina. The original steel arch bridge: the bridge of the Grapes of Wrath days. This was the bridge that had carried the dust bowl immigrants to the promise of a new life in California. The old Trails Arch Bridge carried traffic across the river from 1916 until the newer Red Rock Bridge was opened in 1947. It was abandoned after the new bridge opened, and was converted to support a gas line across the Colorado River. It is still used for this purpose today. The old 1947 Red Rocks Bridge, which once carried the Route 66 traveler across the Colorado, has long since disappeared. It was abandoned in 1966 when I-40 replaced it, and was torn down in 1976. The Red Rock Bridge was built over an old AT&SF Railway right of way because it was wider than the earlier steel arch bridge. Only concrete footings remain today to mark the spot of this once celebrated bridge across the Colorado River. At Park Moabi you can make a right turn onto National Trails Highway and proceeded to follow the old road towards the river. After passing under the railroad bridge and I-40 the old road ends at the Colorado River near the old footings from the Red Rock Bridge and the old Historic route 66 billboard. This billboard once advised travelers that they were about to enter Topock Arizona. 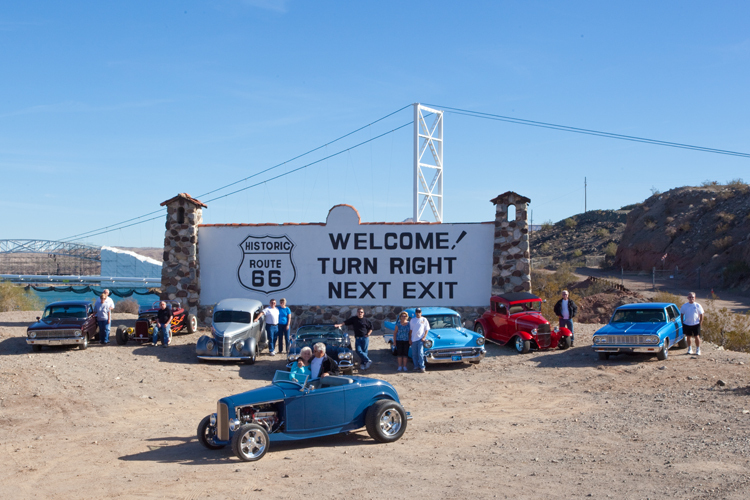 Today, it points Interstate travelers to exit for Historic Route 66. Heading back towards Park Moabi, to the left there is a clearing and driveway going up a little hill. At the top of the hill are the ruins of the Workman’s Cafe. All that is left is a foundation with some sun blasted tiles curling up from the concrete slab. From the pattern of the tiles you can see where the counters and booths once stood. How many travelers must have occupied that space in another time? It is quiet on that hill now with only the wind dancing impatiently through the ruins as if waiting for the day when the desert will completely reclaim this hill as its own. The El Garces Harvey House and Train Depot has been an important part of the history of the area. The original Needles Depot was destroyed by fire and construction of the El Garces followed shortly after in 1906. The building was completed by 1908. El Garces was named after the Spanish Padre who visited the area in 1776. Because the primary purpose of the El Garces was to serve the passengers who came through on the Santa Fe Railroad, its most ornate side faced the railroad tracks. The El Garces was closed as a Harvey House in 1949, and was used as offices for the Santa Fe Railroad until 1988. It was finally closed at this time and fell victim to the ravages of time. The Friends of El Garces was formed in 1993 to help save this historic train depot. Extensive renovation efforts are underway at this time but your support is needed as the total cost of restoration is estimated at $7 to $8 million dollars. The proceeds from the El Garces tours during the First Annual Route 66 Celebration in Needles went to this worthwhile project. Because of you the El Garces may live again.